The first Miriam Haskell jewel to join my collection was this marvellous Cloisonne bangle. I bought it some years back from ebay at a very good price and have cherished it ever since. The art of Cloisonne is quite a complicated one originating from the Middle East and becoming really popular in China especially during the Ming Dynasty. The process begins with a metal object that has to be decorated. It is usually made of bronze, just like this bangle, and whether it is a plate, a vase or a bead, the process is identical. Small metal strips called cloisons (French) are soldered onto the base in the desired pattern. The capsules of space formed by the strips are then filled in with enamel. The piece is heated in an oven and once cooled, the cloisons and enamel are permanently set into the base. 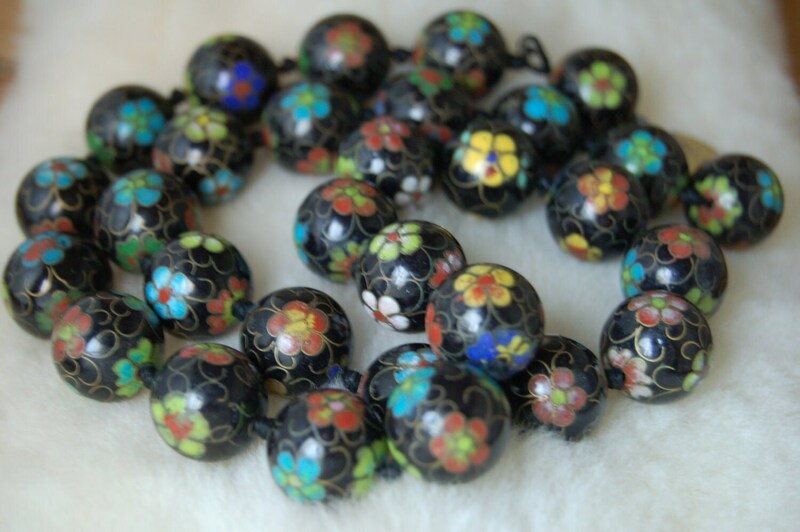 The beads of the necklace in this picture are made with the cloisonne method and they are extremely well made, each bead being carefully knotted to be thus separated from the other one and avoid damage. There are 30 beads in all... aren't they simply gorgeous? They are for sale here. There is such exquisitely lovely beauty in these richly detailed cloisonne pieces. You're so very lucky to have been able to add that gorgeous Miriam Haskell bangle to your collection. Thank you very much for your recent blog comments, dear gal! I really hope you have a beautiful Sunday and countdown to Christmas.